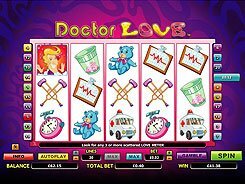 This is a love-themed slot with three reels and five paylines. 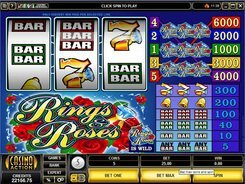 With the background showing red roses and diamond rings all over, the game features classic symbols like bars, bells and sevens. There are two configurable betting options: a coin value ($0.25–$5) and the number of paylines to wager on (1–5). 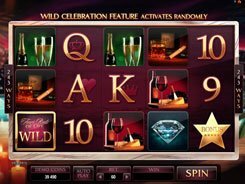 Adjusting these options, you can bet anywhere from $0.25 to $25 per spin. The lowest-paying symbol is a bar that awards 5 to 100 coins for three matching bars or any combination of three single, double and/or triple bars. Bells and sevens pay out 200 and 300 coins respectively, for three of a kind. The most lucrative icon is Rings and Roses logo. 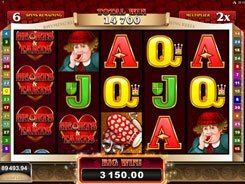 Hitting three of them on line #5 produces the grand prize of $30,000 if you have placed the maximum stake on that winning spin. Three logos landed on any line other than line 5 will bring you $5000 to $20,000. 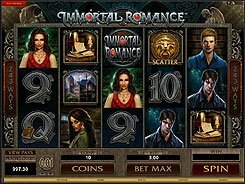 Finally, the logo serves as a wild symbol substituting for all other icons in the slot. PLAY FOR REAL MONEY!